A group of scientists have proposed a new method to clear up space junk using a satellite that shoots out powerful beams of plasma. Researchers from the Tohoku University, Japan, and The Australian National University, think that potential debris disasters might be averted by sending up a cleaning probe. The satellite works by blasting two plasma beams in opposite directions. The idea is that the particles in the gas exert enough force to slow down the cosmic trash down and knock it out orbit, where it proceeds to fall into Earth’s atmosphere and is naturally destroyed by burning up. "If the debris removal can be performed by a single high-power propulsion system, it will be of significant use for future space activity," said Kazunori Takahashi, co-author of the paper published in Scientific Reports and an associate professor from Tohoku University. One beam is aimed at the rubbish, and the other beam is used to accelerate the satellite. 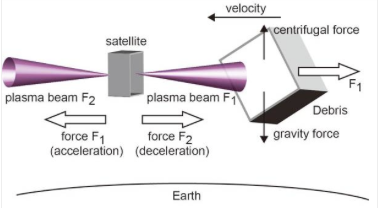 The deceleration beam will create an equal and opposite force and push the satellite away, making it difficult to maintain a constant distance away from any junk, unless the probe fires up its opposing plasma thruster. The team has calculated that in order to send a one to two tonne object to reach the Earth’s atmosphere in about 80 to 150 days would require a thruster performance of 60 milliNewtons for 1,800 seconds. The beam should be emit about 2.5 to 3 kiloWatts of power, standing seven meters away from the target. Experiments in a laboratory using a helicon plasma thruster controlled by a magnetic field was able to generate a 30mN thrust with a power less than 1.5 kiloWatts for 1,500 seconds. "If the debris removal can be performed by a single high-power propulsion system, it will be of significant use for future space activity," concluded Takahashi.